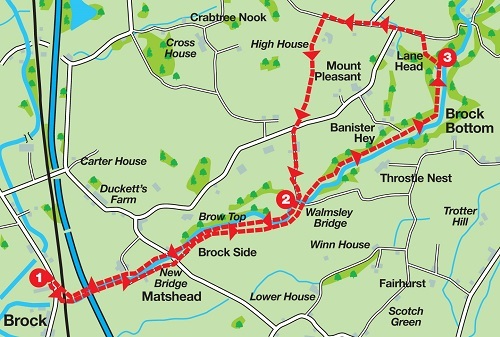 Earlier this year we published a walk connecting two bus routes from Preston between Bilsborrow and Longridge. It was an interesting route but for many readers access to Preston Bus Station is not convenient. With this in mind we offer this route starting close to Barton Grange Garden Centre on the A6 north of Bilsborrow. It has two aspects. First a delightful walk along the River Brock one of Lancashire’s hidden gems. Second after a relatively short climb a traverse of fields with a marvellous open aspect giving a wonderful panorama of the Fylde and Preston. 1. From the entrance to Barton Grange cross the A6 turn right and walk down to the Landover dealers. Turn left on a footpath that crosses the car park to a footbridge crossing the railway. under the M6 motorway. 300yds beyond the motorway cross a footbridge on the right and continue on a path leading up to a lane by New Bridge. into a large field. Still with the river to the left though obscured by trees keep ahead until you arrive at Walmsley Bridge. onto a footpath taking you back alongside the river. After ½ mile the path enters a large long field and bears left to meet a track on the edge of woodland. while the path enters a less wooded space after a coin studded log. to enter a field. Keep ahead for a short distance and then bear right noting a fine view of Beacon Fell to the right. where it becomes Gonder Lane. Pass the junction with Bleasdale Lane on the right. ¼ mile further on turn left onto the farm drive of what you will soon discover is the well named High House Farm. As the track bends to the left take a footpath on the right through a metal gate. Cross the field to a stile by a metal gate on the far side. a very muddy track leads to Clarkson's farm. (This may be best avoided by entering the adjoining field through a convenient gap and walking parallel to the track). Cross over a stile into the driveway of Clarkson's Farm. cross it and turn right onto a footpath to retrace your outward steps.